My grandmother recently passed away. She and my grandfather could both be considered 'hoarders' because it seems like they kept EVERYTHING. Fortunately (or unfortunately), they labels almost everything they had with the name of the relative they wanted to receive the item after they passed away. Most of the items I received are of little sentimental or monetary value. 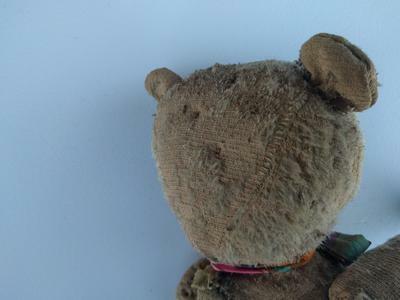 I did receive this bear (see photos) that has a handwritten note stating "This was your great grandmother's bear. 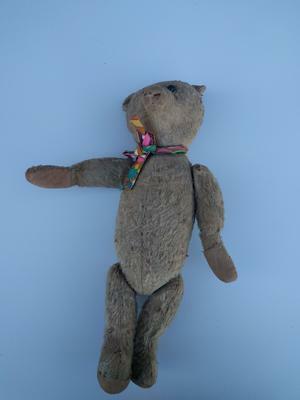 It is a Steiff bear circa 1920. This was very important to your great grandmother and now I am giving it to you". 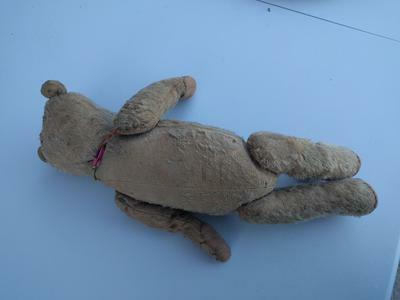 Now, my grandmother has been suffering from dementia for several years so I'm not exactly sure on the date of the bear, but I do know it belonged to my great grandmother, so it is certainly old. Can anyone ID it for me and let me know if it has any value? It is quite worn and fragile. It is 16" tall. Thanks in advance for any assistance you can provide!